Did your business crush it in 2017?! We recently ran a poll on our Instagram page and asked what our followers struggled with most last year. The results were staggering, with 95% of our followers saying they struggled most with digital strategy. Now, to be fully transparent, only 50 of our followers took this poll, but it was enough for us to want to write this article…hopefully it helps you too. For those who have a solid digital marketing strategy, digital marketing can become the gift that just keeps on giving! As each year passes and with advancements in technology and consumer behaviour, digital marketing is the only way to stay ahead of the competition. For those who don’t have a digital marketing strategy, you’re simply giving your competitors the opportunity to take your prospects from straight from under your feet! If you are already an established business, the first thing you should do when building your new digital marketing plan is to look back at your marketing activities from the previous year, see what worked and what didn’t. This will help you understand the mistakes you may have made and how you can do things better this year, by knowing how your audience reacted to those campaigns. If you are not tracking the results of your campaigns, you don’t know whether they are successful or not. So for those of you that haven’t set up tracking, make it your mission now before you start putting your hard earned money into these campaigns. Put simply, anyone who wants to make money online should have a sales funnel set up in some way or another. The primary goal of a sales funnel is to move someone from one stage of the customer journey to another, and convert website visitors into paying customers. From the first time your prospect hears about your product to the moment they make a purchase, they move through different stages of the customer journey. • Awareness: Before you can sell anything, your prospect must be aware that there is a problem and that you or your business can solve it. This is when you need to organise a strategy to stand out from your competition to get noticed. Facebook advertising is a great way to begin this part of the process. • Evaluation: Once people are aware of the problem they have, and that you have a solution, they move into the evaluation stage. The prospect will now most likely evaluate the various choices available to them, including your competitors, or worst of all – not do anything about their problem. This is when you need to stay consistent, stay in front of your customer with valuable content, ensuring that they see you as a trusted authority in the market and convince them to move through the funnel with you. This is where you will lose most of your prospects if your offering isn’t relevant and optimised. 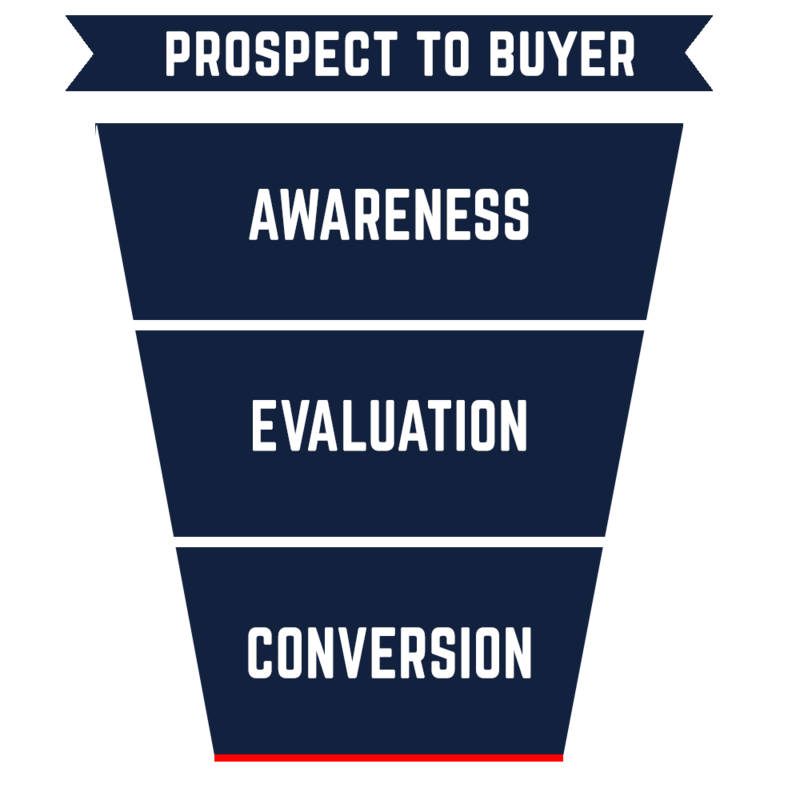 • Conversion: If you can move your prospect through the evaluation stage, its time to close your prospect and turn them into a customer. But to really ensure continued growth for your business, knowing that the customer journey doesn’t finish after the purchase, will ensure that your follow up is optimised and your up-sell system in place. If there is one easy way to spend good money after bad, it’s running marketing campaigns to people who aren’t interested in your offering. It is now more important than ever to understand who your audience is, what their problem and how you can get their trust. In the current digital era, targeting your ideal customer has become more accessible than ever, and spending the time to find your customer will relate to cheaper advertising, more qualified leads and higher conversion rates. Did you know that Google changes it’s algorithm up to 500 – 600 times per year? Facebook is up there too! So if these are the platforms you use to market your product and/or service you need to stay on top of how these changes will affect your marketing strategies. Stay reactive this year, stay agile and be proactive if you see any changes in your marketing results. Gone are the days where you can just put a product in someone’s newsfeed and be confident that they will purchase it right then and there. With such an influx of online advertisers over recent years, consumer behaviour has evolved. Before anyone purchases your product, you need to build an authentic relationship with them. A great way to do this is through personalisation and making it truly feel like you are talking to them. There are a ton of automated personalisation tools out there to use these days, so make a note of researching how you can personalise your message. Stick to these tips when building your digital marketing strategy for 2018 and we guarantee that you will achieve success with your digital campaigns. If you still aren’t sure what to do, book a free digital strategy session with us today!